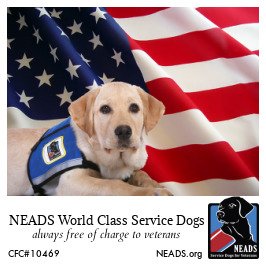 Independence and companionship for veterans, wounded warriors, autistic children, the deaf and disabled by providing custom, highly trained Service Dogs. Help provide these much needed Service Dogs! Randy and Service Dog Jethro. A service dog is more than just a friend who is by my side wherever I go. No, a service dog is much more than that. A service dog is like being the mayor and having a key to every building in the city. A service dog is a door that leads to independence. My first service dog from NEADS was a black lab named Dede. Dede immediately became the best friend a guy could ask for. I instantly noticed a difference in my daily life. Those stubborn objects out of my reach suddenly became objects in my hand within seconds. Unfortunately, at the age of eleven, Dede developed cancer and passed away last year. After 10 years of independence, daily things I took for granted, were once again a challenge. I went to NEADS and started over; discussing the basic tasks I struggled with and was matched with Jethro. I feel complete again and have regained my independence. We are without doubt best friends and make a great team. When someone sees Jethro's shiny red vest and asks what NEADS is, my response is two words: "my independence."